Incredibly sad. That’s what a good goodbye should feel like. I’ve already shared my thoughts about the death of a media brand that I’ve loved and loved being part of. I’m writing this a couple hours after the 1pm farewell of our old friend KSWD/Los Angeles, 100.3 The Sound. As virtually every member of the Sound team – not just the airstaff, everybody – spent the last handful of hours congregating in the building, there was rarely a dry eye in the house. I doubt that a single member of a crew with probably a millennium or more of radio experience didn’t spend a little time reaching for the Kleenex box, and that’s a good thing. Allow me to illustrate why I’m saying that with two points, after which, I’m going to get deeply personal…again. Let’s be clear about who was in our building today: radio veterans. Sorry, I’m understating the matter. This was an airstaff with something like 350 years of radio experience. Add in the rest of the team and the total number would be absolutely mind-boggling. We’ve been there, done that, and bought the t-shirt so many times that we spent plenty of time recounting the other format flips we’ve been through. And still we wept. Why? Well, you had a truly remarkable group of people, many of whom have known each other since the 1980’s. More importantly, we all came together in a remarkable combination that just worked. Even that, however, would not have been sufficient to bring on the waterworks if it weren’t for the fact that everyone in that building felt that they’d been part of something extra special, something that, but for the vagary of regulatory rules, didn’t feel like it should be dying today. The sense of loss was palpable, and while it was a sense of loss of relationships and time, it was also a sense of loss of mission, of commitment to something bigger than “playing the hits”. Think that has nothing to do with the business of media? You’re wrong, so let’s talk about it. The Sound may be in the past, but The Sound is the future. Right now, we’re still stuck in the old school Arbitron Nielsen game. We’re worried about every little tiny piece of tuneout avoidance and quarter hour maintenance we can dive into. We’re still slaves to the meter or the diary. I’m not saying that we shouldn’t be that. The unfortunate reality is that keeping radio stations afloat requires that stuff for now. Radio stations with huge passive audiences count on the law of large numbers to make this happen. Basically, if you reach out to enough people, random chance dictates that a certain percentage of those people will respond to your message. The problem with this, of course, is that as audience fragmentation constantly increases, there are fewer people making up that large-number pool, a statistically-consistent fraction of whom will engage with your radio station and its partners. A station like The Sound, on the other hand, punches far above its Nielsen weight because it’s genuinely engaging. (You should see the social engagement numbers we’re talking about here.) Radio stations like The Sound deliver bodies to advertisers at a clip far ahead of what the law of large numbers would predict. Engaging content requires more than just the general sense of mission that every media brand – including every radio station – needs. It requires a nearly-frenzied focus on finding ways to connect at a very emotional level with the audience by being authentic, truly unique, and fanatically committed to the cause, whatever the cause in question might be. The numbers will eventually force business to a point where engaging radio becomes the more profitable thing, rather than passive, meter/diary-focused radio. Don’t believe me? Take a look at the recent history of television for a guide. We may have to continue to play the Nielsen game for now, but we’d better be ready to play the engagement game too. Winning TV numbers are literally 12% of what they were in the mass audience era. What are you going to need to do to win in the future? You’re going to need to worry a lot more about giving people reasons to keep tuning in over and over and over than about the things that cause people to tune out. I turned into a particularly blubbering mess today with one coworker, someone who, in the very early years of my career, was particularly generous with her time and advice and who made a much bigger difference to me than she realizes. (Yes, I’m talking about you, Rita.) I renewed a whole lot of other relationships during my five years at The Sound as well. I made plenty more new relationships that will survive the station’s demise – with plenty of very special people – and here I’m talking about both coworkers and audience. Why? Well two reasons: first, because the station was so driven by the notion of engagement, it attracted people who wanted to engage. Oh, and second, we all got really lucky and the engaged people happened to also be really good people. So, yeah, I feel pretty lucky about that. That said, there’s no luck in what The Sound accomplished, just a simple lesson. 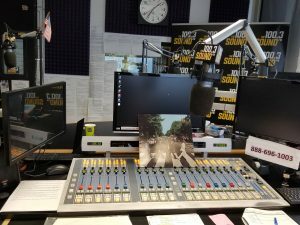 A good goodbye is heartbreaking because both the audience and the station personnel were so engaged that it hurt terribly to see the place where our relationships converge – the radio station – come to an end. Would your brand’s demise be heartbreaking for both the people who create it and the people who consume it? If not, its risk of an early demise is going to rapidly increase in the very near future. © 2012 - 2019 STEVEHOFFMANMEDIA.COM - All rights reserved. Serving the creative business community since 2012. Join our mailing list to receive the latest news and updates from stevehoffmanmedia.com.